These are lovely and light after indulging over Christmas. Pre heat oven to 180C/gas 4. Grease and then line the bottom of a 9”/23cm square baking tin. Put the butter, sugar, egg, egg yolk, flour, almond extract andground almonds in a bowl and beat together with an electric hand whisk until smooth and creamy. Stir in the cherries. Pour into prepared tin and level with the back of a spoon. Scatter the flaked almonds over the cake mixture. Bake in the centre of the oven for 20 – 25 minutes, until risen slightly and is firm to the touch. Leave in the tin for 10 minutes before transferring to a wire rack to cool completly. Cut into slices. This recipe makes 8 slices. But you can always do as I do and double it if you need more. Made in the microwave, so no need to worry about boiling and candy thermometers. Although you do still need to be VERY careful not to splash yourself with the melted sugar mixture! Mix together sugar, water, syrup and salt in an oven proof 2 qt. casserole dish, or similar. Loosely cover with a lid or cling film. Microwave on High (100%) for 6 minutes. Uncover. Microwave on High for another 9 minutes. While syrup is cooking the last 9 minutes, beat egg whites on high until stiff. Slowly pour hot syrup over egg whites while beating at high speed of mixer. Add extract and continue beating on high for another 4 to 5 minutes until mixture holds its shape. Quickly drop teaspoons of candy onto waxed paper and top with half a glace cherry. Leave to cool. If coconut is your thing, these are going to be your ideal cupcake. Filled with coconut, topped with a delicate pink icing..a sweet treat in cupcake form. Preheat oven to 180C/gas mark 4 and line a 12 hole muffin tray with paper cupcases. In a large bowl cream the butter and sugar until pale and smooth. Add the eggs, one at a time, mixing for a few minutes after each addition and adding the vanilla and almond extract at the end. Combine the two flours in a separate bowl. Add one-third of the flours to the creamed mixture and beat well. Pour in one-third of the coconut milk and beat again. Repeat these steps until all the flour and milk have been added. Fold in the desiccated coconut with a metal spoon. Carefully spoon the mixture into the cupcake cases, filling them to about two-thirds full. Bake for about 25 minutes until slightly raised and golden brown. 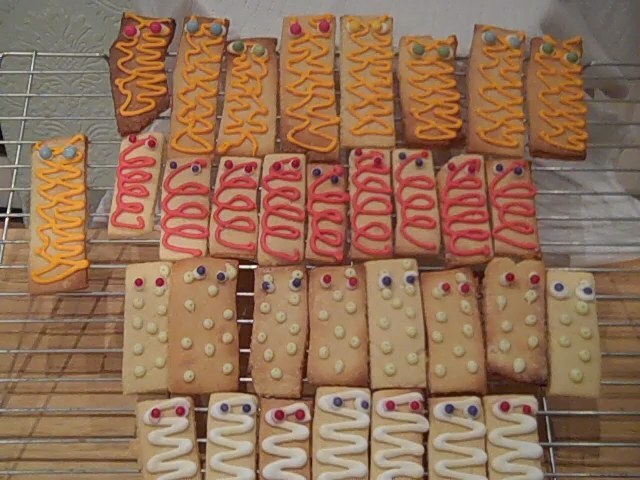 Remove from the oven and leave in the tins for about 10 minutes before transferring to a wire rack to cool completely. 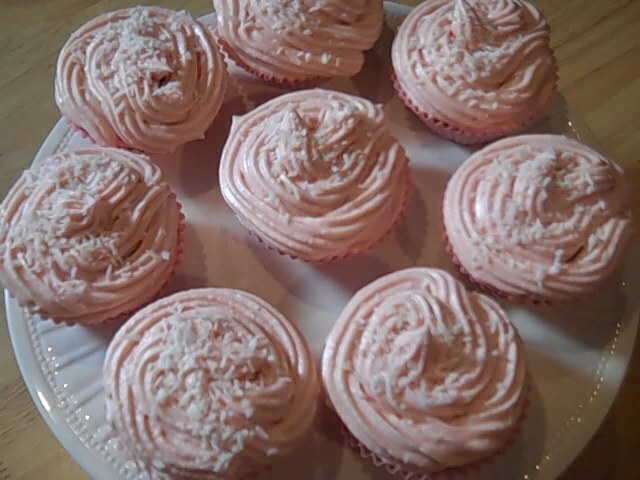 Once they are completely cool, ice with the pink-tinted vanilla buttercream and sprinkle with desiccated coconut.